The club would change hands at least a few times, and it changed names, too: Cheviot Hills Country Club (1941-1943); Rolling Hills Country Club (1944-1945); and California Country Club (1945-1951). It hosted business leaders, star entertainers, and the world's best golfers. ​In 1950, the club's owners – actor/director Frank Borzage , actor/singer Fred MacMurray , Hollywood manager Bö Roos, and actor/filmmaker John Wayne – sold to hotelier Sanford D. "Sandy" Adler, who developed the California Country Club Estates neighborhood in its place. In 1917, a Culver City-based social group decided to establish their country club and golf course in the hills of Palms (Los Angeles), overlooking Culver City from the north, on what had been the John D. Hawes Ranch. Initially called the "Culver Country Club" and the "Culver City Country Club," it would cover over 100 acres of Francisco Higuera's allotment of Rancho Rincón de los Bueyes . On April 29, 1917, the Los Angeles Times reported that the "Culver City Country Club, an organization perfected during the past week, has leased 105 acres of land in the rolling hills just north of Culver City and plans to at once build a clubhouse and lay out a golf course." "The club has obtained a twenty-year lease of the property secured …. Plans for the clubhouse, which will stand upon a high knoll commanding a sweeping vista of the city, the valley and the ocean, are now being drawn by A. S. Heineman." The paper told the story of a picnic on the grounds at which officers were elected: George W. Somerville would be president; Culver City founder Harry H. Culver was elected vice-president; H. W. McNutt was to be secretary; and E. H. Allen, would serve as treasurer. Seven directors were also chosen: Harry H. Culver, Charles R. Stuart, H. W. McNutt, George W. Somerville, J. F. Haight, E. H. Allen, and John D. Carson. The club's founders were well-known at the time – though Harry Culver is the only one whose name is usually attached with the club. That is understandable, since his name is attached to a nearby city. See, e.g., Golf Historical Society's " California Country Club, Culver City, California .") Charles R. Stuart was a "prominent Hollyw ood financial figure." ( LA Times, Nov. 1, 1925 .) H. W. McNutt (c. 1874-1932) was an attorney ; ​George W. Somerville was a judge ; and Edwin Hampton ("E. H.") Allen (1885-1942) was a producer and actor . Architect and contractor Arthur ("A. S.") Heineman (who was said to be drawing up the clubhouse plans) would provide those services to club officer and director (and Culver City baker) J. F. Haight. ( Southwest Builder and Contractor, Jan. 11, 1918, p. 16.) And John D. Carson (at least in 1920) was "Assistant Trust Office in Charge of Subdivisions, Trust Department, Los Angeles Trust and Savings Bank" ( L.A. Times Nov. 15, 1920 ). "Less than two years ago, several clubmen met by appointment in a lemon grove, just north of Culver City," says the press representative of the Culver City Golf Club. "The ungroved acres round about them were barley fields. They followed the driveway, drove past the ranchhouse, and reached the highest point on the acreage. From this vantage point was spread out before them and unexpected view. Beyond doubt this was the highest knoll between Los Angeles on the east and the sea on the west. Mountain, city, valley and sea presented a panorama not to be duplicated anywhere in this part of the country. The grounds were undulating, dotted here and there with small groves of growing shade trees. "It wasn’t ground particularly adapted to farming, but it was an ideal location for a country club. It was near to the city, near to the sea; near boulevards and crossroads, making it peculiarly accessible. Electric lines passed its threshold, the breeze from the ocean warned it when cool and cooled it when warm. "There were five in the party, and their verdict was unanimous as to the desirability and practicability of the grounds for country club purposes. "It was all over in thirty minutes. These five successful professional and business men, Judge George W. Somerville, John D. Carson, E. H. Allen, Harry W. McNutt and Harry H. Culver had organized the Culver City Country Club. "But war had been declared. It was a patriotic sprit the ranchhouse was converted into an unassuming clubhouse, an expert was employed to lay out the golf course. It was to be made an eighteen-hole course. "The entire course was scraped and resown in alfilaria and lawn clover. …. “twenty-five years ago planted long avenue of pepper trees at the John D. Hawes Ranch. The Culver City Club, a mere name … was launched into verity a few months ago, and it already boasts an active membership of about 200. The annual outing of the Optimist Club took place at the Culver Country Club …. In the liberty tournament … Mr. Walter Ralphs is a champion. The clubhouse … is the old ranch house …. The Palms hills stretching their heads beyond Culver City, catch the ocean breeze, and also partake of the coolness of the mountain air. The Culver Country Club possesses as its chief treasure the highest of these hills. It is upon one of these that the plan is to place the new clubhouse …. “an extensive bathing pool will occupy the site of the one-time reservoir, and when further arrangements are made for an ample supply of water for the entire 200 acres wide stretches of green turf, sunken gardens and other horticultural dreams will materialize. Images from August 10, 1919, Los Angeles Times article, " When Rancho Turns Country Club ." ​​In January 1920, the Los Angeles Times reported that "The club grounds and golf course comprise a site of fifty seven acres just off the National boulevard at the outskirts of Los Angeles." "The plans, prepared by H. H. Whitely, call for an expenditure of approximately $45,000." "The officers and directors of the California Country Club include Harry H. Culver, president; Watt L. Moreland, vice-president; George D. Bavin, vice-president; H. W. McNutt, secretary; Mrs. C. J. Jeffries, assistant secretary; John D. Carson, treasurer; and D. A. Hamburger, J. D. Carson, William McSchane, G. D. Bavin, H. W. McNutt and H. H. Culver, directors." Drawing of the proposed clubhouse from January 4, 1920, Los Angeles Times . The California Country club links is a place of romance – and 18 holes. The touches of romance come in the shape of rustic old buildings; pepper trees sheltered vales where a golfer, miscuing a stroke, may make his lamentation to high heaven in the secure knowledge that no part of his outburst will reach ears for which it was not intended. And if that isn't romance, then what is? The crowning touch of the romantic stuff, however, comes in the shape of Luise Glaum' s – wait a minute – house. Miss Glaum is the film actress. Her home lies hard by the golf links. Heustis reported that Frank McGregor, "a canny Scotsman," was club steward and Jack Stone was the club professional. The club's officers at the time were Harry H. Culver, president; Watt L. Moreland, vice-president; and John D. Carson, treasurer. Directors were D. A. Hamburger, W. A. Clark, Jr., Dr. T. J. Ruddy and George W. Somerville. An oil boom has struck Culver City, threatening to wipe the California Country Club out of existence in its present locality. According to a rumor which persisted in our local golf circles yesterday the club is said to have been offered the lumpy sum of $350,000 and 12 percent in royalties for permission to drill oil wells on the property. The links of the club are declared to be resting atop a huge bed of oil, ready to spout forth streams of dollar-making fluid. The California club is one of the news clubs in the south. After an unfortunate start with its grass greens, due to the hiring of a man who had no previous experience except with sand greens, the club has been making splendid progress with its course and plans have been going forward for a grand opening tournament next fall. The month after the oil scare article, on June 12, 1921, the Los Angeles Times carried the following page of photographs of the club and its links. August 1927, Fairchild Aerial Surveys photograph (for Standard Oil) showing golf course with clubhouse and entrance at upper right. (Photo courtesy UCSB Library Aerial Photography Collection .) Counterclockwise from the left, the club is bordered by Queensbury Drive, (today's) Manning Avenue, and Club Drive. The club was a featured amenity as neighborhoods grew up around it. In 1922, the Castle Heights development was advert ised as "Adjoining the California Country Club." In 1925, Monte-Mar Vista 's developers promoted their location: "Direct entrance to the California Country Club on the southern border." In 1939, the Leimert Company, promoting its Cheviot Knolls , said "Famous California Country Club and the Westside Tennis Club with a membership of champions and motion picture stars adjoin these gently sloping hills, with Rancho Public Golf Course 5 minutes away." As late as 1949, Beverlywood builders Weber & Diller boasted that their homes were " nearby California Country Club ." The club hosted frequent community events. Ticket for June 15, 1935, American Legion post benefit. Although the tangled financial affairs of Cheviot Hills Country Club leave the ultimate future of the organization a doubtful matter, it will definitely continue operations until the first of the year, according to Ed R. Hurst, the just-retired president of the club. “We have a lease until Jan. 1, and all bills are paid until that date,” Hurst says. A group is attempting to bring in sufficient new members to keep the club, known for many years as the California Country Club, going on a sound basis. Hurst’s resignation, as wells as that of the entire board of directors, becomes effective Oct. 1. Rolling Hills Country Club today officially opens its doors and fairways as the newest private club in the Southland. Located in the heart of Cheviot Hills, the club opens under the ownership of John Montague, golf’s erstwhile "mystery man," and his partner Sheppard (Shep) Kelley, local sportsman. A steam room and barbershop have been built in and the place generally overhauled with complete facilities of a luxury club. The course is in fine condition. Membership is being strictly limited to the higher brackets with a heavy sprinkling of film, radio and war executive names. The links layout is only a few minutes from several studios and war plants. 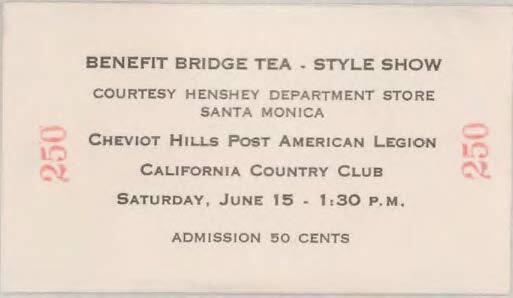 Cheviot Hills, a public club, folded last June because of financial difficulties, same reason the California Club went out of business after years of prosperity as one of the better Southland private clubs. Montague and Kelley took over the links a few months ago and, with material they already on hand, started remodeling the club. John Shepard Kelley (c. 1904-1945) and John Montague (1903-1972) may have been the public faces of the reorganized club. But it appears that Kelley and Montague had partner from the start: Bö Roos a nd his entertainment industry clients – Frank Borzage , Mitchell Leisen , Fred MacMurray , and John Wayne operating through Roos' Beverly Managment Corp. Winifred Kelley (John Kelley's widow) and John Montegue would later allege that, on November 1, 1943, John Kelley, Montegue, and the Roos group agreed to buy the California Country Club for $250,000: "Club buildings were to be remodelled and refurbished . . . and then sold, with Montague and Kelley each to receive 25% of the net profits." Indeed, Borzage was pictured in the above article covering the Rolling Hills Country Club's opening, with a picture captioned, " Johnny (Tarzan) Weissmuller . . . and Film Director Frank Borzage get set to preview the links while and electrician still works in the locker room." The same article refers only to Montague and Kelley as o wners. John M. Montague, who died in Studio City Thursday at 67, was a character . . . one of the most familiar in California sports and movie circles in the 1930s and 1940s. He was known by various names . . . La Verne Moore (his real name), “The Sphinx of the Links,” “The Mysterious Monty,” “The Phantom of the Fairways,” “The Garbo of Golf.” And he was also known by various numbers on police department blotters. Some called him the world’s greatest strong man. Some called him a con man. Arthur Abrams, a Los Angeles photographer with whom Montague was formerly associated, says that he was a rum runner on the St. Lawrence River in the Al Capone days. In the same era, he reportedly passed himself off as a policeman in a minor extortion racket in New York state, drawing a suspended sentence. Some of Monty’s friends included many of Hollywood's biggest names – Oliver Hardy (with whom he lived for some time), [Bing] Crosby , Spencer Tracy , Bob Hope , Richard Arlen , W. C. Fields , Guy Kibbee and Johnny Weissmuller. He had baseball tryouts as a pitcher with both the Boston Braves and New York Yankees. Babe Ruth be-friended him …. In 1938, Montegue married Mrs. Esther Plunkett, a wealthy Beverly Hills matron. “He made and lost a million dollars several times,” said Abrams. Bö C. Roos Sr., one of Hollywood's leading business managers, with clients including John Wayne, Fred MacMurray, Red Skelton and Lloyd Nolan, died yesterday at the age of 69. Because of his flamboyant, high‐powered and hectic way of life, Bö (pronounced Boo) Roos could have been the model for the movie stereotype of the Hollywood business manager. A bulky, well‐tailored man with cold blue eyes and a pencil mustache, he made about 60 phone calls a day, commuted by plane around the world, worked with his clients, played poker with them, went to Mexico with, them and was said even to Weep with them. For more than 30 years he handled private investments of Hollywood's top screen stars, which in a typical year amounted to $7‐million, and battled with the Internal Revenue Service for them. His clients had also included Marlene Dietrich , Joan Crawford , Merle Oberon , Carole Landis , Lupe Velez , Frank Borzage, Johnny Weissmuller and George Brent . A Rolling Hills clubhouse gambling arrest got coverage in 1944, with the press reporting "Thirty-five men were taken into custody . . . when they were found assertedly engaged in five stud poker games at the Rolling Hills Country Club, 3100 Club Drive, West Los Angeles." ( LA Times, April 14, 1944 .) "John Montague, the widely publicized trick golfer, was proprietor of the club but was not present." "Lt. J. R. Steward, night chief of the Los Angeles vice squad, said he and Sgt. F. E. Durham "visited the club several days ago and talked to Montague about its operation. Late [that] night they returned in plain clothes with five other officers and watched play for 10 minutes before taking the men to the station." (Ibid.) "One $50 pot and a slot machine were taken for evidence." Bail of $100 each was promptly posted, and the case was resolved days later. The attorneys for the "32 physicians" and one undertaker, "told the court the doctors had engaged the club for a dinner and lecture and that afterward some of them got up a 'friendly little game of penny ante.' The court, remarking that there was no evidence of commercialized gambling, dimissed a Penal Code count and on the plea of guilty to violation of the municipal ordinance sentenced the defendants to $10 or five days in jail each." The undertaker paid the money – as he had the bail). ( LA Times, April 18, 1944 .) The latter report did not mention the slot machine. The name-change back to California Country Club came in August 1945, around the time of John Kelley's separation from the club and not long before his death. "John Shepard Kelly, 41, restaurant owner" "until recently . . . part owner of the Rolling Hills Country Club" died on November 16, 1945. ( LA Times, Nov. 21, 1945 .) On August 12th, the Times referred to "California Country Club (nee Rolling Hills)." Days earlier, the August 3, 1945, the Times had reported on Frank Borzage's initial celebrity tournament at the Rolling Hills Country Club. So, the name apparently changed that week. John Montague remained associated with the club in some reports (an August 18, 1945 , article calls Montague the club pro). However, after 1946, the Bö Roos group, particularly Borzage, would become more prominent in the coverage, while while Montague's name disappeared. I joined the California Country Club, which was started by Fred MacMurray, Johnny Weissmuller, and John Wayne. Bo Roos was their business manager. The men bought the land, refurbished the rundown grounds, and had a drive for membership – and I signed up. I was off work at three o'clock in the afternoon, and nearly every day I went directly to the club to play golf. I played with some amazing people: Babe Didrikson , who loved to gamble, Johnny Mercer , Harold Arlen , Ira Gershwin , and Swifty Lazar , among others. Plans for a $2,000,000 country club hotel on the site of the California Country Club, near Culver City, were announced yesterday by the owners, Fred MacMurray, John Wayne, Mitchell Liesen, Frank Borzage and Bo Roos. If plans are approved by property owners in the vicinity and by zoning officials, the owners said they plan to break ground Jan. 1 for a 270-room hotel, a glass-enclosed clubhouse with roof garden and dining room for 1000 guests, 35 bungalows, tennis courts, swimming pool and a four-story garage. The construction, expected to take 12 to 18 months, will be on nine acres not now used by the golf course, William Allen and [W.] George Lutzl are architects. Later in 1948, the club celebrated a "Silver Jubilee Week beginning Nov. 28 [to] commemorate the 25th anniversary of the founding of the California Country Club." Festivities included a dinner dance emceed by George Jessel . Fred Ussher was still (or again) club president. ( LA Times Nov. 19, 1948 .) How 1923 was determined to be the founding year is a matter for conjecture. Sale of the California Country Club in Culver City to a syndicate headed by Sanford Adler is expected to be completed this week end, The Times learned last night. For the past several years the club has been operated by an investment company [Beverly Management Company] of which Bo Roos is president. The principal owners have included Frank Borzage, John Wayne, Mitch Leisen and Fred MacMurray. The club was one of the most popular golfing centers in the Southland during the 20s and early 30s. No indication of its future status has been given but rumors earlier held that Adler’s group planned to subdivide the property. Sale of the California Country Club for approximately $1,000,000 was announced yesterday. The club, a 107-acre property at 2929 Club Drive between the MGM and 20th Century-Fox studios, is one of the oldest golf courses in Southern California. It was bought by Sanford Adler and Associates, owners of the Del Mar Hotel and other holdings. The Beverly Management Corp., represented the sellers, Frank Borzage, John Wayne, Bo Roos and Fred MacMurray. The purchase climaxed three months of negotiations, with several bidders taking part, including an organization representing club membership. The club was created in 1915 as a nine-hole course with oiled greens and sand tees. California Country Club may be just another golf course with its green rolling hills and its outstretched fairways, but to many of the boys attending Hamilton this is a place of occupation. The club is located behind Hami in Cheviot Hills. On the weekends the boys trudge up and down on the course and not just for the exercise. Take, for instance, the boy who happens to be in your physiology class. He works on Saturday and Sunday, so he will be able to take out the cute blonde who sits in front of him. Working as a caddie is quite the life. He gets paid on the average of a dollar-twenty-five an hour. The caddie can go to work any hour of the day, depending on how much money he would care to make. Moreover, if there are any Joe movie goers reading this feature, you will be seeing most likely your favorite stars. This may seem quite the life, but there are disadvantages, also. When caddying, the caddie always hopes to get a good player, so he won't have to chase the ball all over the course. If he is an unlucky caddie, he'll probably get a player that hits a rousing 120 for 18 holes. The average is usually around 80. The regular fee for 18 holes is $3.00. The member usually tips the caddie. The average that is paid is usually $4.50. If any of the boys reading this feature have the idea of caddying at the club, here's wishing you luck; that you don't get stuck, holding the bag. On February 29, 1951, the Los Angeles Times reported on the club's "fade-out." California Country Club, for parts of three decades one of the Southland's most popular and famous private courses, staged what amounted to fade-out Friday night. Fred Ussher, president of California for more than 20 years, was honored by club members at a dinner that evening. A full program of golfing activity, including a pro-amateur, has been staged the last couple of days. All this is preliminary to the closing of the course within the next month or two. Two days later, on March 2, 1951, a Los Angeles Times sports columnist shared the news that the club remained open: "The boys at the California Country Club wish it known that they are NOT closing down their golf course for some time to come and even when and if building starts on the proposed subdivision nine holes with two tees each will be available, along with the clubhouse." Jack Gage, golf pro at the course, has leased the property for an indefinite time, or until Adler and his associates complete plans for subdivision of the Culver City links. Gage announced yesterday that the clubhouse will also be open to the public a little later after plans for its operation are set. Green fees for the club's opening round as a public course tomorrow will be $3.50 and regular green fees for subsequent play will be announced later, Gage said. California Country Club’s new owners held a lot drawing recently to divide the property. The bulldozers will soon mark the end of another nostalgic era in Los Angeles history. Since its reorganization in 1943, California Country Club has been both a meeting place and melting pot for the great, near great and average Joes. Where, but at California, could you see such prominent music-world talent as Buddy Morris, Harold Arlen, Johnny Mercer, Ira Gershwin, Harry Warren, Johnny Green and Paul Weston . At what other club but this (where pomp and circumstance don’t exist) could you regularly see Frank Borzage, Johnny Weissmuller, Fred MacMurray, John Wayne, Dean Martin, Red Skelton, George Seaton and "Double F” [Frank] Fenton . . . to name but a handful of top-ranking movie people . . .
And where else could you rub elbows with some of the town’s leading manufacturers, business-men and attorneys, the Ben Swedes, Sam Barenfelds, Bernie Jaslins, Jerry Nemers , Norm Thelans, Ben Paysons, etc. The documents reflect Beverly Management deeding the "larger parcel" to Country Club T.H. Corp. on December 15, 1950. Albert E. Marks (an attorney) would sign the "Declaration of Restrictions" as president of the corporation; his law partner, Sydney. J. Dunitz, the corporation's vice president, notorized the document. (See Estate of Arstein (1961) 56 Cal.2d 239 ["Albert E. Marks, Aaron Levinson, W. Alan Thody and Sydney J. Dunitz for Objectors and Respondents"].) Eleanor Coburn was the corporation's secretary. The club's laundry equipment was auctioned on May 8th, 1951 . The club house went a couple of weeks later, when " California Country Club's swank clubhouse, scene of many a golfing party through the years, was peddled by Sanford Adler to a wrecking company for $3000." ( LA Times, May 27, 1951 .) The news report said, "It is not being demolished . . . Nine holes of the course remain, at least temporarily, with Jack Gage operating it as a public links . . .."
The course was open through, at least, July 2, 1951. July 2, 1951, newspaper advertisement for Public Golf at the former California Country Club. The California Country Club was part of the growing Cheviot Hills community. Eighteen holes sharing the rolling terrain, winding streets and fairways made the area unique and desirable. Little earth was moved. Horse and dray merely touched up the land as nature had created it. . . .. The fourth hole was a Par 5 dogleg skirting the Tennis Club; the fifth and sixth holes bordered Queensbury. The seventh was a 200‑yard, par 3 over a barranca. California was a challenging links, requiring a variety of shots and never fenced. The Clubhouse was high on a hill, bounded by Club Drive and Shelby. Many celebrities played the course. None quite came up to an exhibition round of Babe Didrikson Zaharias. Her booming shots off the tee sent many a male member to the driving range. Surviving the depression, the Club became a victim of World War II. Those on the first tee at 9 a.m. December 7, 1941, will never forget the hysterical voice of an announcer over the radio in the golf shop, “The Japanese have bombed Pearl Harbor.” With the drastic loss of members to the Armed Services, the course could not be maintained, water bills could not be met. The land was purchased by a syndicate of film stars as an investment. Sanford D. ("Sandy") Adler (1909-1991) was many things: home-builder, hotelier, Mob front man, and developer of California Country Club Estates among other tracts. Sanford Dennis Adler's death was barely noted in the Los Angeles press, when passed away on June 13, 1991. Adler's entry into the West Coast hotel business traces back to 1945. On September 2, the Los Angeles Times reported, under the headline "Rosslyn Hotel Purchased by Detroit Man," "The 1100-room Rosslyn Hotel and Annex at Fifth and Main Sts. . . . has been acquired . . . to be added to the hotel holdings of Sanford D. Adler, Detroit . . .." The reported price was $1,500,000. A couple of weeks later, on September 17, 1945, the Times reported, "Purchase of Hotel Del Mar by Sanford Adler for a reported consideration of $750,000 ...." It concluded, "Adler also owns the Rosslyn Hotels in Los Angeles and others in the East." (Ibid.) This author has not learned anything of other Adler hotels "in the East." ​Six months later, on March 30, 1946, the Times reported that Adler had paid $450,000 for the "Normandie Hotel property and equipment at the corner of Sixth St. and Normandie Ave."
That was about the same time he got the El Rancho Vegas . In March 1946, "it was reported that [Joe] Drown had leased the El Rancho to San Diego hotel man Sanford 'Sandy' Adler, who headed up a 'local syndicate of several corporate investors.'" ( J. H. Graham , El Rancho Las Vegas .) "Charlie [Resnick], who was allegedly connected with Detroit's ' Purple Gang '" was one of those investors according to OnlineNevada.org . The two men [ Moe Sedway and Morris Rosen] found an eager buyer in Sanford Adler, who owned the El Rancho Vegas. Louis Weiner Jr. helped Adler form a corporation called Flamingo Hotel, Inc., with Adler controlling 49 percent of the stock. Other investors included Moe Sedway, Gus Greenbaum , Morris Rosen, and Dave Berman. The Adler group, which included Charlie Resnick of the Detroit Purple Gang, paid $3.9 million to the Nevada Projects Company and took possession on July 16, promising "no major managerial or top personnel changes." Moe Sedway and Gus Greenbaum were mobsters whose names may have been merged to inspire the name for the character " Moe Greene " in The Godfather. ​​Adler also marketed the Del Mar Turf and Surf Hotel with his Las Vegas properties: "Vacation Time At Your Favorite Resort Hotel" read the copy of an October 15, 1947, Times ad , which featured all three of the hotels. Sanford D. Adler, hotel operator, yesterday disclosed that he has granted an option for the purchase of his controlling interest in the Flamingo Hotel at Las Vegas, Nev. The option, given to Gus Greenbaum and other stockholders of the hotel, has an expiration date of next July 15. Adler acquired a majority of the stock in the Flamingo from the estate of Benjamin (Bugsy) Siegel last July 16 after Siegel was murdered in Beverly Hills. Since obtaining control of the hotel, Adler has been active in its management. Although he declined to reveal the amount of the offer made to him by Greenbaum and the other stockholders, Adler yesterday said, "It was so good, I couldn't turn it down. Adler also operates El Rancho Vegas in Las Vegas and the Rosslyn and Normandie hotels here. With apologies to Mario Puzo , did someone make Adler an offer he could not refuse? Albert Woods (" Al W.") Moe, in The Roots of Reno (2008) (p. 205), put Adler's position at the Flamingo this way: "when Bugsy Siegel was shot, Adler was asked to run the Flamingo. He was certain he was in charge, even though he only had to put down $195,000 to own half of the then $3.9 million property. He was not. He was the front man." The officer mentioned as another individual interested in the Las Vegas set-up Morrie (Doc) Rosen, whom he described as a New Yorker who had dominated liquor distribution in Puerto Rico. The very morning of the Siegel slaying, Chief Anderson said, "certain members of the group" interested in the Flamingo, including [Moe] Sedway, walked into the hotel and advised "certain people that they were taking over." Later, he said, after a dispute over control of the hotel led to litigation decided in favor of a faction represented by Sanford Adler, Adler came to blows with Rosen, representing the opposing faction, who finally exclaimed: "'There's blood on our hands now and you're not going to get away with this.'" The chief said Adler had reported this comment to him personally, and promised to assist him in further investigation of the Las Vegas dispute, but had left this section of the country and had never returned as far as he knew. Until his death by violence, Siegel had a controlling interest in the Flamingo Hotel at Las Vegas, one of the country's most elaborate gambling establishments. Associated with Siegel in the hotel and its gambling enterprises were Moe Sedway, Allan Smiley, a gambler with a long criminal record who came to Las Vegas with Siegel, Meyer Lansky , and Morris Rosen also old-time associates of the New York mob. After Siegel’s death the operation of the Flamingo was taken over by Sanford Adler, a gambler with a long record of arrests, and a number of his associates. Adler entered into an agreement with Sedway, Rosen, and Gus Greenbaum who controlled the wire service in Phoenix. Under the agreement, Adler was to have control over the operation of the hotel, although Rosen, Sedway, and Greenbaum held the controlling number of shares in the hotel. After a violent disagreement with Greenbaum, Adler suddenly sold out his interest and retired to his gambling clubs in Reno and Tahoe, leaving Greenbaum, Rosen, and Sedway in undisputed possession of the lucrative Flamingo operation. This author does not have the so-called "long record of arrests." However, two were found in news reports. First, in August 1947, Adler "was booked on a charge of possession of gambling equipment . . . after a Sheriff's raid on the Hotel Del Mar garage." "Sheriff Bert Strand said Adler . . . was booked on a misdemeanor charge of violating a county ordinance prohibiting possession of gambling equipment and was released on $250 bail. Sheriff Strand termed the raid a 'prevention move.' No one was operating the games." ( LA Times, Aug. 9, 1947 .) "The equipment siezed was roulette wheel, three dice tables and two blackjack tables, which Henry Paronelli [who claimed to be their owner, and to whom Adler said he had leased the garage] valued at $55,500." ( San Bernardino Sun, Aug. 12 & 24 , 1947.) A retrial was set for January 15, 1948, after Adler's "first trial ended Nov. 20 when the jury reported an 11-to-1 deadlock." ( LA Times, Nov. 28, 1947 .) Whether that trial was held and any outcome has not been uncovered. The battery complaint, according to police, grew out of an argument in February, 1946, between Adler and Morris Weiss, 65 [sic], whom the hotel man had hired to do some upholstery work. Weiss complained that Adler kicked him, police said, but Adler was quoted as saying he "only gave him a shove." Despite his record, Adler was licensed to run El Rancho Vegas "after Wilbur Clark , Moe Dalitz ’ front man, left in 1947" (Al W. Moe, The Roots of Reno), so he was able to stay in the Nevada casino business after leaving Las Vegas. He went to Reno and Lake Tahoe. The new casino, called the Tahoe Biltmore, was fronted, but actually put together by Sam Termini. Also known as Sam Murray, the San Mateo County gaming club owner was being backed by his godfather, Charles Binaggio . . . ..
Before the casino was finished, Binaggio was the victim of a mob hit . . .. The [Internal Revenue] Bureau decided that Termini owed $303,000 in back taxes. The commission also raised the names of Elmer "Bones" Remmer, and Eddie Sahati. Both were running gaming in the San Francisco Bay Area in the 1940’s …. "Bones" sold his Calneva casino to Sanford Adler and Charles Resnick for $800,000. Adler, seemingly awash in cash, paid over $500,000 for remodeling of the Club Cal-Neva in Reno, and then spent only slightly less at the Lake Tahoe site. After the government auctioned off the Tahoe Biltmore, he purchased it from the winning bidder for $350,000 and used it for overflow lodging from the Calneva. ​ ​Sanford Adler worked for builder Edward Rose (patriarch of Edward Rose & Sons ) in Detroit. ( Detroit Jewish News , July 5, 1991.) Before leaving Detroit, Adler (as Sanford D. Adler, Inc.) built homes in the Sherwood Forest Neighborhood . Sherwood Forrest had (and still has) a mandatory homeowners' association enforcing restrictions – perhaps the inspiration for the association Adler set up for California Country Club Estates. Adler's Sherwood Forest houses include the Max M. Fisher House , 19240 Parkside Road (Nov. 15, 1940) and another at 2845 Cambridge Road (Jan. 3, 1941). SurveyLA's California Country Club Planning District includes not only the Adler Tracts, but also Tract 3494 ( Castle Heights ) and Tract 19364 . The California Country Club Planning District is a good example of the work of a merchant builder of mid-century era residential properties in West Los Angeles . It is associated with Los Angeles merchant builder Sanford D. Adler. Adler was active in Florida and also developed a small tract called Northridge Living Conditioned Homes in the San Fernando Valley designed by modernist architectural firm Palmer & Krisel. His organization owned the Del Mar Hotel as well as other holdings. In 1951, Adler subdivided an approximately 100-acre portion of the California Country Club golf course, which had been developed by Harry Culver. The new California Country Club Estates consisted of 410 Ranch-style single-family residences, which were initially sold from 1952 to 1955. Around the same time, the California Country Club Homes Association (still in operation today) was created to maintain restrictions and construction standards. Appealing to individuals with middle class incomes who worked in the entertainment industry, the California Country Club Estates development – then valued at $15,000,000 – was sold out by 1955. Many of the houses have been enlarged with the addition of a second story, and the original wood and brick cladding has sometimes been replaced by stone, stucco, or clapboard. These alterations impact the overall integrity of the neighborhood, and therefore it does not appear to be eligible for listing as a historic district. However, many of the houses retain the original wood board-and-batten siding, exposed rafter beams, porch brackets, diamond-pane windows, and dovecotes. The spacious feel of the 1950s-era development oriented toward the automobile with its wide streets and prominent garages and driveways is retained. Moreover, original features of the tract such as streetlights with cast iron posts and mature street trees remain. Therefore, the district may warrant special consideration in the local planning process. As noted above, "Adler was active in Florida." There is a Sanford D. Adler subdivision – Sanford D. Adler Sub 76-16 B – in Fort Lauderdale, Florida. His other work there is not known by this author. 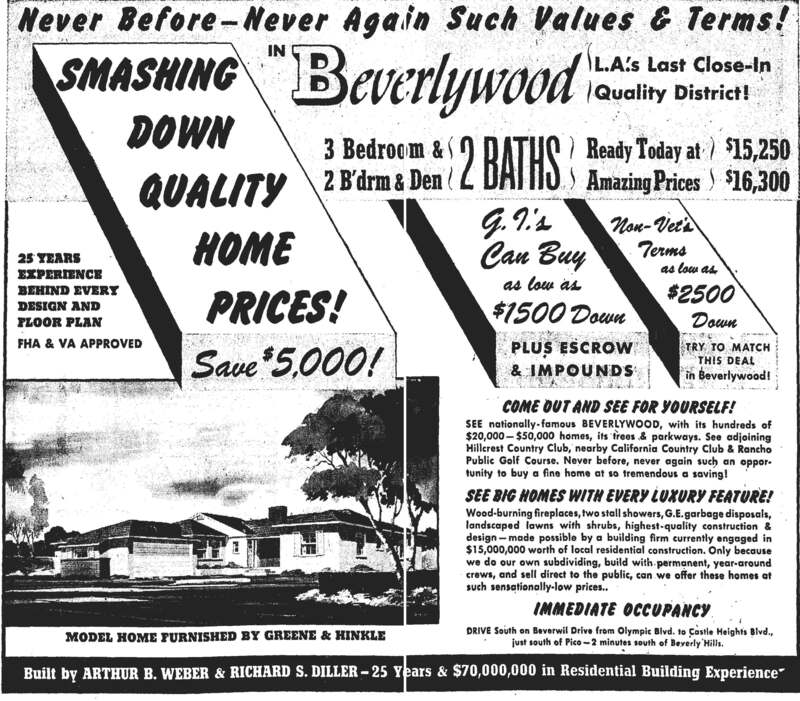 Initial California Country Club Estates advertisements, like this one from December 2, 1951, were spare and focused on the subdivision's aggregate value: the $12,000,000 development. The sales office was at 3154 Queensbury Drive, in the new tract. This ad, accurately, said the development was "Adjacent to Cheviot Hills." On February 24, 1952, the Los Angeles Times reported that "More than 80% of the homesites in the second unit of California Country Club Estates have been sold with the deals totaling over $2,000,000, according to report by Milton Gordon, sales agent for Sanford D. Adler, developer." The sale of several 2000-square foot homes has launched the new Hillcrest Construction Co. development in Cheviot Hills' California Country Club Estates . . . . Built on a semicustom basis the homes are priced at a flat $28,250, which includes the 2000-square-foot (liveable area) home, lot, landscaping, planting and sprinkling system. The buyer has option of several floor plans, interior colors and exterior finish in redwood, Palos Verdes stonework and stucco . . .. The model home, now nearing completion, features 16x13-foot master bedroom with dressing room, second bedroom and cedar paneled den, 25x17-foot living room with 8-foot Palos Verdes stone raised-hearth fireplace, 12-foot floor-to-ceiling glass doors, two baths, kitchen, dining room and entry hall and two-car garage. A picture of the Hillcrest Construction Co. model home (shown in the following ad) accompanied the article. June 8, 1952, advertisement for "America's Home of the Year" at 3051 Cavendish Drive, California Country Club Estates. The advertised builder was Hillcrest Construction Co., and Hillcrest Country Club was shown in the advertisement. Adler's next development, immediately north, would include "Hillcrest," too: " Hillcrest View Estates ." The Santa Monica Freeway was a decade off, and Southern Pacific's Santa Monica Air Line passenger service was infrequent (and would end in 1953), so Adler advertised that the homes were "within walking distance of bus lines." Private Rancho Country Club had become the Cheviot Hills Recreation Center in 1949, so he touted its "public swimming pool and tennis courts." The attraction of newly subdivided California Country Club estates in Cheviot Hills as a residential center was shown in the report that $1,190,000 worth of homes built there by Markowitz Bros. have been sold over that past few months. The construction and design organization, whose sales are under the direction of Jacques La Satier Co., specializes in homes costing from $28,500 to $41,500 and ranging in size from five-bedroom, four-bath-and-den homes. The residences feature 16x28-foot den lanais, floor-to-ceiling doors, shake roofs, beamed ceilings and living arrangements at the rear of the homes. The Greene & Hinkle furnished model home, with appointments especially designed to blend with the architecture and floor plans of the Markowitz-built houses, will be on view to California Country Club estates visitors today. The use of different tones of fruitwood furniture and blending fabrics to give a textured feeling to the living room is pointe out as a visitor’s attraction at the model home, while an innovation is the introduction of antiques to complement the French Provincial decor, it was explained. Now under construction in the new section of Cheviot Hills are 20 homes of varying sizes and design, built by Moe and Dan Markowitz. The residence may be purchased on 4¾ % loans, the builders said. July 29, 1952, advertisement in the LA Times . October 17, 1952, advertisement in the LA Times . Adler did not have to go far for his next development. Immediately north, he subdivided and marketed Hillcrest View Estates , starting in late-1953. 1956 found Adler developing "Storybrook Village," a "Contemporary-styled 143-home development" in the San Fernando Valley, where Mid-Century Modern homes were designed by Palmer & Krisel. ( LA Times, March 4, 1956 ; SurveyLA . The Living-Conditioned Homes Residential Historic District contains an excellent concentration of Mid-Century Modern residential architecture in Northridge, designed by noted Los Angeles architects Palmer and Krisel. It is also significant as an innovative example of post-World War II suburbanization, espousing the principles of a progressive homebuilding initiative known as “Living-Conditioning.” The period of significance has been identified as 1957-1959, accounting for the district’s period of development, and 72% of properties contribute to its significance. The district encompasses two adjacent residential tracts, both of which were subdivided in 1957. Both of the subdivisions were developed by Sanford D. Adler, a seasoned builder who had developed several other postwar tracts around the Valley. Adler collaborated with architects Dan Saxon Palmer and William Krisel , well-known for “bringing Modernism to the masses” by incorporating features associated with high-style Modernism into mass-produced tract housing. Palmer and Krisel designed the houses within Adler’s development, which consisted of four basic plans with a variety of décor packages and exterior finishes that produced a cohesive yet diverse collection of houses. The Living Conditioned Homes district is unique in that it is the only Palmer and Krisel tract in the San Fernando Valley to exhibit the flamboyant characteristics most commonly associated with their “Alexander-style” developments in Palm Springs and Las Vegas. Houses within the district exhibit degrees of architectural detail and expression that are not often seen in neighborhoods composed of mass-produced tract housing. The term “Living-Conditioned” is associated with the concept of living-conditioning, a progressive homebuilding initiative that was sponsored in the 1950s by "LIVING for Young Homemakers" magazine. . . . Adler’s development in Northridge appears to have been the fullest expression of the initiative’s goals and objectives. Development within the tract began in 1957 and continued through 1959.